The light-gray, crumbling granite of Horse Ridge provides the perfect backdrop to this beautiful lake with an easy-to-access shoreline. The trail lazily moves through a mosaic of lodgepole stands of various ages due to fires, interrupted by occasional meadows. Follow the signs and stay left past two trail junctions. After the second junction, the trail begins its climb through a forest of large, old trees. As you gain elevation, you cross through a variety of habitat types from manzanita to forest as it reaches the saddle below Horizon Ridge. The trail gets steeper as it climbs away from Horizon Ridge. Views begin to peek to the north. After wrapping around the ridge, just off trail to the north, a wonderful panorama opens up. The trail then descends to a stone ski hut on the shoreline of the lake. 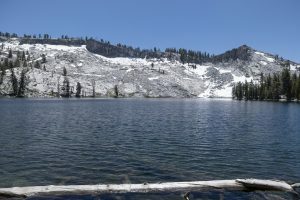 Horse Ridge looms large at the opposite end of the lake with crumbling granite accenting the cool, blue water of the lake. Trailhead: Look for the small, signed parking lot for Ostrander Lake along the Glacier Point Road.